For instance, when I wrote “LED nav lights, a fast moving target” in 2008, it quickly got comments about various interference issues and especially in regard to the popular Orca Green Marine tricolors (often installed right next to a masthead VHF antenna). But then OGM redesigned the nav light circuitry (their 2010 tech blog post still up) and today offers a full line of LED nav lights I’ve never heard a complaint about. But then again, some early complaints about badly designed or manufactured LED fixtures — or especially replacement bulbs — involved interference you could actually hear as noise on a VHF radio, and what the USCG is warning about is a more insidious silent interference whereby you simply don’t hear the real signals that should be reaching your radio (or chart plotter as AIS targets). They have devised a way to test for this on your boat, however, and they are also asking mariners to report any LED lighting products that seem to cause trouble. So I’ve published the entire Safety Alert below, and it can also be downloaded from the USCG Safety Alert \ Lessons Learned page. Plus I tried the contact page where you can report issues, and it’s easy (as seen on the screen at bottom). I’m hoping that any readers who do detect problems report them here too, though I’m also hoping that most all modern marine LED lighting fixtures do not create any interference issues. ships in different ports have experienced degradation of the VHF receivers, including AIS, caused by their LED navigation lights. LED lighting installed near VHF antennas has also shown to compound the reception. This Safety Alert is provided for informational purposes only and does not relieve any domestic or international safety, operational, or material requirement. Developed by the U.S. Coast Guard, Spectrum Management and Telecommunications Policy Division. Distributed by the Office of Investigations and Analysis. Questions may be sent to HQS-PF-fldr-CGF-INV@uscg.mil. 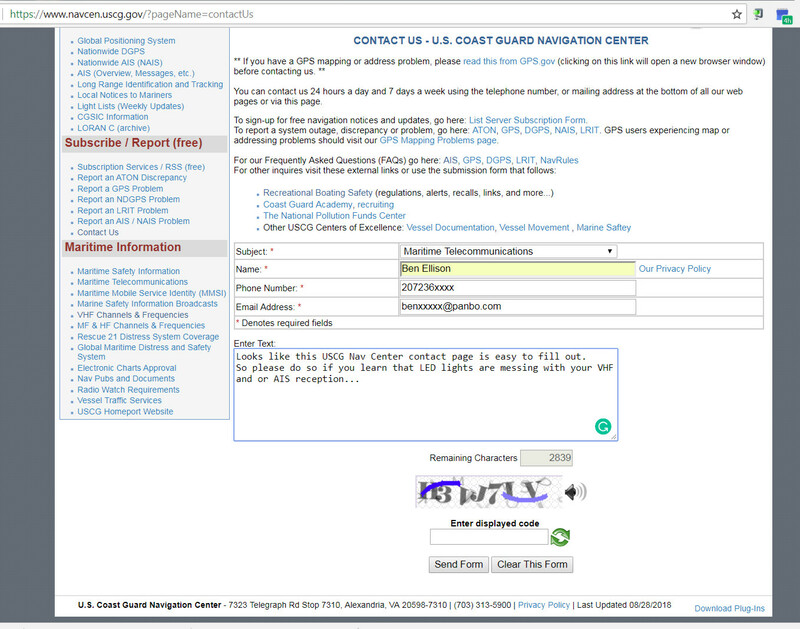 While its nice to see the USCG interested in the subject, their proposed test is pretty meaningless. FM radio receivers operate their squelch control by measuring the amount of high-frequency noise (above the frequencies used for voice – typically 5-7 kHz) they are detecting – with no signal, the noise level is maximum, while a signal entering the receiver reduces or “quiets” the amount of noise – hence the phrase “a full-quieting signal”. Their test looks for a signal on the VHF channel, not noise, which is indeed a more subtle and insidious problem. IMHO, if you are concerned about noise being radiated by LED fixtures, a better test is to tune in a weak but steady signal – a distant NOAA WX station works well – then turn on your suspect lights. If the light is radiating noise, the signal will audibly degrade or even disappear into the noise. 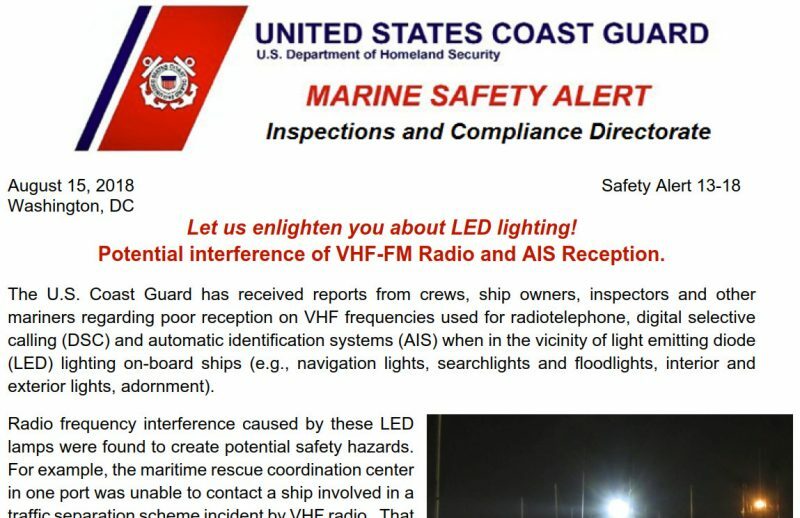 FWIW, we haven’t seen any problems with our LEDs bought in the last 3-4 years from Marinebeam, though we did have some LEDs from a decade ago that needed their own radio license! I have a Signal Mate LED a few inches from my VHF antenna on the top of the mast as well as Marinebeam LED’s throughout the boat and never experienced any interference at all on VHF. I even heard VTS call me when approaching NY Harbor this summer. All my LED’s are second generation purchased about four or five years ago. I have seen this problem most recently with a 43ft sailboat I re-wired. The method described in the press release is more than adequate to the task. If you’d like to refine your search for the offending LED remove the antenna from a handheld and walk around with it, with the squelch all the way down…. noise blaring. You will notice some subtle changes in the character in the noise and it will peak and fade as you pass by the offending device. This will probably be a cheap LED assembly with some type of voltage step down circuit. Lower power LEDs just put a resistor in series with the diode (LED) and burned a bit of power as heat in the resistor. As lumens increased it became difficult to dissipate heat internally from the power wasted in the resistor. So much of the industry has shifted to some type of step down voltage circuitry. Unfortunately, the amateurs in this LED lighting industry fail to realize the potential for radio frequency interference being generated within their products. But that is ok, ’cause the FCC does. If you have something as simple as an RC oscillator or any other type of synchronous circuit in a consumer or industrial product it falls under the gigantic umbrella of FCC Part 15 just like a radio, tv or computer. There are more than a few sources of cheap LED lighting products coming on shore which are not properly FCC Part 15 test and/or certified…. After all it is just a light bulb, right? Wrong. If the guy in the boat next to you finds your boat emitting RF noise he has every right to demand it be fixed even if it doesn’t seem to bother any of your electronics. RF Noise is generated by electrical switching circuity. Digital wave-forms are square-wave in nature with very high rise times. Digital wave-forms generate RF noise. These digital wave-forms can be generated from LEDS, switching power supplies in inverters, etc. The RF noise generated by these devices can appear within the VHF band. This unwanted RF noise will raise the noise floor within the VHF band and degrade the radio’s signal to noise ratio. Its like being in a room where everyone is talking loudly. You can’t hear the softer voices. Using the squelch method can show that the noise floor has been raised because the unwanted noise will break the squelch threshold. A better way is to tune to a weak signal and turn the light on and off as already mentioned. Shakespeare makes an antenna tester that generates an RF VHF signal to test the receiver that may work for this application. A radio shop can get more exacting measurements by measuring the SINAD or sensitivity of the receiver when the LED light is turned on and off but this takes commercial test equipment capable of measuring 12 dB SINAD or 20 dB quieting. An addition to the previous post. The RF noise can get into the radio by conduction through a wire or by radiation though the air. Testing methods using SINAD and quieting will work for conducted noise. Radiated noise can be measured by averaging the noise level across the speaker terminals (AC voltage) with the squelch open (on a quiet channel) and then noting any changes when the LED light is turned on and off. This test method will quantify how much the noise floor is raised. I cannot offer any report of an LED lamp causing interference to my VHF Marine Band radio receiver’s useful sensitivity, but I did find that a Part-15 home-type DVD player caused significant reduction in reception when simply powered on. The DVD player is a device that is supposed to comply with Part-15 radio emission, as far s I know, yet it caused a rather noticeable increase in radio-frequency noise in the VHF Marine Band. My testing method, as mentioned above, was using weak signals received from distant NOAA weather broadcast stations as the signal source. With the DVD player powered off, there signals from stations as far as 100-miles away were received. With the DVD player powered on, those signals disappeared into the noise floor. THank you for promptly posting and promoting responses to this USCG warning. RFI issues affecting radio performance is rampant with our digital age. LED lights are only one common culprit. Florescent lighting is worse and your laptop may also be causing serious interference. Although I retired from the Coast Guard 5 yrs ago I’ve been working closely with them regarding this issue. Thanks to the many who have responded. We’ve learned a lot. For example, we’ve learned that the problem is more severe than we initially realized. While some responses indicated no problem for them, several others confirmed that the problem has indeed affected them. We also learned that LED navigation lights certified to the IMO-recognized shipboard EMC standard IEC 60553/60945 is no guarantee they won’t interfere with VHF radio or AIS. IEC 60533 includes the statement “The radiated emission requirements within the range of receiving frequencies presume in the bridge and deck zone a minimum distance of 3 m between the emitters and the receiving antennas”. In other words, compliant LED navigation lighting should be separated at least 3m from antennas, especially VHF antennas. As Judy mentioned, RFI from devices such as fluorescent lighting and laptops is also a long standing problem. What’s new here however is best described by the FCC in a Notice they released in 2016: “..we have found that emissions from RF LED lighting devices are non-periodic, broadband in nature, and are produced as a byproduct of the internal driver circuitry within the RF LED lighting device. These types of broadband, non-periodic emissions have adequate energy and potential to generate radiated emissions well above 30 MHz.”.  See https://apps.fcc.gov/kdb/GetAttachment.html?id=K0pZdRE7biF3aqgO4XZ8cw%3D%3D&desc=640677%20D01%20RF%20LED%20LIGHTING%20v01&tracking_number=20518. Finally, the test procedure described in the Safety Notice was never intended to detect an interfering signal, but instead to determine if the RF noise floor was being raised as a result of the LED operation. Nevertheless if your radio is capable of receiving NOAA Weather Radio, tuning to a weak station as instructed above is an excellent means for detecting interference. Thank you for suggesting it.